Despite being by the same authour and being on a similar topic, this book is a different animal from Daniels' Marvel history. While that was a straight chronological history, with the obligatory touchstones of characters and titles, this follows DC's history in a more thematic way. Each section examines what was happening to the company at a certain point in time by exploring the books it was publishing, the characters it was producing and the people it was employing. Also, this book works more as a collection of almost independent 2-page essays on a unifying concept than as a continuous historical narrative.Not a bad read, really, and just about the right length (and depth) for a reader of slightly more than casual interest like me. Its shortcomings are few, far as I'm concerned: a bit too much information on some items that could've been lumped with others (I didn't really need more than one section on the Reeve Superman movies, or even the then-more-recent Batman movies, or on the various merchandise that has been created on DC licensing over the decades -- a few photos would've done the job); the coverage of films tended to lapse almost immediately into criticism, while that of comics rarely did; and too often particular images/issues/characters were discussed, but without an accompanying picture (while other times there were pictures that seemed to be just taking up space).I'd recommend this for comics fans, but not for diehard DC buffs or for people with only a passing interest in comics in general. This book was a super resource when it came to the history of DC, as well as the history of super heroes and comics in general! Each spread was dedicated to a different significant event in DC's history. Whether it was comics, merchandise, films or television, page are splashed with excellent photos and chock full of information. The index is incredibly comprehensive and very handy if you are looking for something (or someone) specific. The book covers a lot of ground without coming across as a boring history book. The only problem I had with it was that it wasn't in chronological order. Events were grouped together but not in order by date. Other than that I highly recommend it as a keeper for any DC fan! One of the most fascinating books I've read! Quite reasonably priced, and featuring a very nicely written history of the characters, writers and artists of DC Comics, this volume is highly recommended to anyone who would love to learn more about the breadth and scope of this epic universe. As a Marvelite, I had a very basic knowledge of the DC U, but now I know the differences between the three Flashes, the JLA and JSA, the various Robins and much more! This was a fun book of information about the characters and events of the DC Universe. Enjoyable if superficial history of DC comics. The best part of this book are the illustrations. Pretty good for any comic book lover. 3 stars only because DC doesn't have my favorite heroes. This is a really awesome, image-heavy history of DC comics characters. 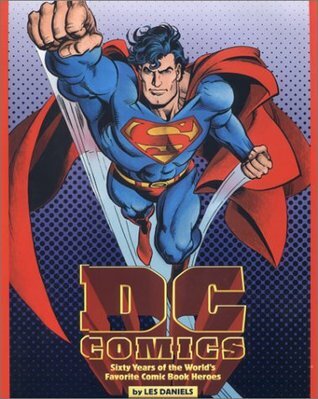 Not so much as a coffee table book as it is a serious (although not text-heavy) history for semi-fans of DC greats.